When Tolstoy wrote “every unhappy family is unhappy in its own way,” he was surely thinking of circumstances like those in this film. Jason’s family is cold and emotionally abusive. His best bud Colin’s family are loud and sloppy, but they are still a lot of fun to hang out with. The lady in the closest neighboring home to the cabin Colin’s dad rented has a zombie family living in her cellar. To her, Colin’s family and friend look like supper time in Peter Ricq’s Dead Shack (trailer here), which releases today on DVD. Jason will be joining Colin’s family for a weekend of stupid horseplay. Nobody will be more irresponsible than their divorced father Roger. Of course, he has brought along his young Asian party-girl girlfriend Lisa, giving rise to much eye-rolling on the part of Colin’s older sister Summer, whom Jason carries a torch for. While Roger and Lisa waste no time getting wasted, the three kids go out for a little exploring. Inconveniently, they happen to spy the “neighbor” serving up two meatheads from town to her feral undead family. Thanks to Colin’s stupidity, she also knows that they know. Jason and company are in big trouble, but they don’t have much adult supervision to rely on. Dead Shack passes a major test for horror comedies. It would still be funny without the zombies and gore. Ricq and co-screenwriters have penned some razor-sharp dialogue and Roger’s familial relationships are rather endearing in their own idiosyncratic way. In fact, this is one of the most realistic and believable families immortalized on film in years. That is pretty sad to say, but true. Donavon Stinson is outrageously funny as Roger, while Valerie Tian is terrific as Lisa, the degenerate diva. Obviously, there is no way she’s going to be the “final girl.” Lizzie Boys also sets a new standard for acid-tongued sarcasm as Summer. As Jason, poor Matthew Nelson-Mahood is overshadowed by them all but that is his character’s lot in life. The real mind-blower is Lauren Holly portraying the psycho cannibal-zombie-enabling neighbor, but frankly, the mindless undead are probably more pleasant to live with than Jim Carrey. When watching this film, we can’t help thinking how much cooler the B-52s’ “Love Shack” would have been if it were called “Dead Shack” instead. Ricq’s Dead Shack is gleefully gory, but it also has heart. When characters get killed, we feel bad about it—but we still have to laugh. 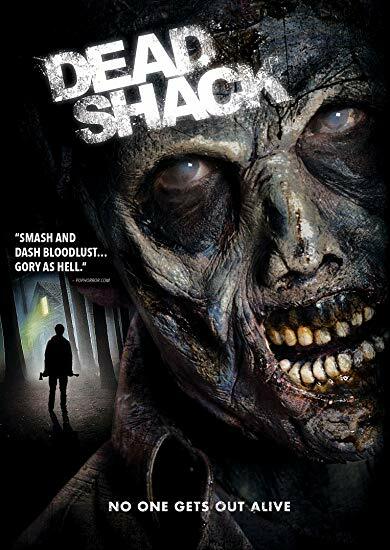 Recommended for horror fans in the mood for mayhem, Dead Shack releases today on DVD and BluRay.